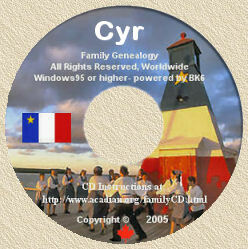 Acadian Genealogy Homepage; Cajun French evolved from the descendants of Acadians arriving in Louisiana. South Louisiana is a dialectal region of the French-speaking world, but it would be a serious over-simplification to think of it as a homogenous region. There is a great variety of sub-regional dialects of French spoken here, based on three main currents: the colonial French that developed among the descendants of the French who first began to settle Louisiana in 1699, the Creole that developed among the descendants of the African slaves brought to work on the French colonial plantations, and the Cajun French that evolved among the descendants of Acadians who began to arrive in Louisiana in 1765 after they were exiled from their homeland in what is now Nova Scotia. Yet there is little pure linguistic stock today. The basic sources influenced each other in areas where the groups came into frequent contact. For example, Cajuns along the Bayou Teche are as likely to speak Creole as their black Creole neighbors, while black Creoles living out on the southwestern prairies tend to speak what amounts to modern Cajun French. Many move effortlessly and even unconsciously between dialects according to the context. All three basic sources were also modernized by steady trickles of immigration, especially in the 19th century by the so-called "petits Créoles," economic immigrants from France, and by refugees from the Haitian revolution, as well as by contemporary academic influences. French was the language of everyday life and government in Louisiana into the 19th century. French Creole planter society supported a small but thriving Louisiana French literary scene including published poets and novelists, theater and opera. French enjoyed equal status in newspapers, legal proceedings and daily commerce. But the Louisiana Purchase in 1803 and statehood in 1812 placed serious pressure on French Louisiana to conform to the language and culture of the United States. With the end of the Civil War, French Creoles understood that their future was necessarily going to be American; they immediately began to send their children to English-language schools. By the turn of the 20th century, their transition to English was virtually complete. Ordinary Cajuns and black Creoles did not get the message until much later, beginning with the arrival of Anglo-American farmers from the Midwest in the 1880s, reinforced by the arrival of Anglo-American oil workers and developers from Texas, Oklahoma and Pennsylvania in the early 1900s. This process was intensified by the nationalistic fervor that preceded and accompanied World War I, by the relief efforts that accompanied the great flood of 1927 and the agricultural and economic depressions of the 1920s and 1930s. As their children were humiliated and punished in schools for speaking the language of their ancestors, Cajuns and black Creoles alike were convinced that the French dialects they spoke were cultural, social, political and economic liabilities. With the wave of regionalism that followed World War II, this stance was reconsidered and efforts were launched to preserve and restore this valuable linguistic resource. What came to be known as the Louisiana French renaissance movement was led by the Council for the Development of French in Louisiana (CODOFIL), a state agency created in 1968. Since then, French has returned to the schools, most impressively in the immersion programs that are once again producing a small but growing generation of young Louisiana French speakers. The Creole spoken in some areas resembles the Creole dialects used in parts of the Antilles. There, linguists, educators and literary figures have been struggling for decades to produce a written form that distinguishes their language from French. Setting aside the debate on that question for a moment, Cajun French is a different matter. Most of what the Cajuns say can easily be rendered in written form by simply using the French language, though Cajuns have generally not done this themselves. An already complex socio-linguistic situation was compounded during the first half of this century by a hostile climate that actively sought to eliminate the French language in Louisiana as part of the Americanization of the Cajuns and Creoles. Both Cajun French and Creole were long stigmatized, denounced as dialects unfit for preservation. It was felt that they had no place in the classroom. Even once French began to be taught again as a foreign language in Louisiana schools, teachers regularly told students that knowing some Cajun or Creole French was worse than none at all. Thus, there is virtually no history of literacy in French among most active Louisiana French speakers as their language remained at the level of oral tradition. Cajun French is a close enough variant of the French language to use standard orthography in most cases. The Cajuns do not always speak according to French rules, yet Cajun French does not differ from "standard" French any more than other regional variations of the French language among speakers of comparable social and cultural background. Whether or not a particular Cajun can write, his or her language can be transcribed with a few adjustments for lexical and syntactical changes. For example, while a speaker of academic standard French would likely say, for "I am repairing my car," "Je suis en train de réparer ma voiture," a speaker of Cajun French would more likely say, "Je suis après arranger mon char." The words are all French, but the vocabulary, syntax and style are all dialectal. Though divided at first, today most serious Louisiana French specialists seem to agree that Cajun French is a variant of the French language and is best rendered using the French system with minor adjustments. For terms not in contemporary French dictionaries (asteure, cil [celui]), etymological and historical dictionaries often provide a solution. Most early Acadian sources can be found in the works of Poirier (1964 and 1977) and Maillet (1971). For regionalisms and borrowings from other languages, especially Spanish and certain Native American languages (brème, instead of aubergine, for eggplant; chaoui instead of raton-laveur for raccoon), references can be found in the studies of Ditchy (1932), Phillips (1936), and Read (1931). Daigle's Dictionary of the Cajun Language (1984) can be helpful despite the author's unusual history of the language. Faulk's Cajun French I (1977) is a rich resource, though the author does not provide a viable written form. Following the same linguistic strategy by which standard French attaches purely euphonic sounds (as in "a-t-il"), words which consistently retain the liaison sound from the plural in all forms are rendered by a preceding [z-], as in un z-oiseau and une z-oie. When the grammar and syntax of spoken Cajun French pose an orthographic problem, as in the variant conjugation of certain verbs, historical spellings can be used (ils estiont, ils vouliont). Otherwise, one can usually find parallels in the French language (je vas, tu vas, il va). The negative is systematically formed without the ne (je veux pas aller; j'ai jamais vu ça; j'ai pas rien dans mes poches; il y a personne dans le bateau). The [u] of tu typically elides before verbs that begin with a vowel (t'as, t'es, t'oublies). In the descriptive grammar being produced by contemporary scholars, the rules observed in actual usage determine how the language will eventually be written and taught. Creole is somewhat complicated by its greater distance from the French language. Many Creole specialists have opted for the creation of new writing systems that seek, as linguist Robert Chaudenson put it, "d'éviter les incohérences du code graphique français" [to avoid the inconsistencies of the French writing system]. Even in the most radical of these, there is a tendancy to base Creole transcriptions on French phonetics. Louisiana Creole is relatively less creolized than the dialects from the West Indies, though it does have some typically creolized elements. Briefly, there is a reduction to a single form in the present, with other tenses indicated by markers: pé, or apé + participle = progressive; té + participle = past preterite; té pé, or té apé + participle = past imperfect; sé + participle = conditional; va + participle = future; similarly, lé or oulé + participle marks volition. The pronouns are mo, to , li, nous or on , vous (formal) / vous autres (plural), yé. There are also lexical shifts and differences. For example, gain, apparently from gagner, is use for avoir [to have]; couri, from courir, is used for aller [to go]. There is also considerable overlap with Cajun French, such as the disappearance of ne from the negative, and the dropping of [u] from tu before a vowel (t'as faim, t'es parti), and the use of old French terms, such as cil for the demonstrative. Cajun French and Creole are often unfavorably (and unfairly) compared to Parisian French. It should be considered, however, that Parisian French itself varies greatly from one arrondissement of the city to another, and from the campus of the Sorbonne to the market districts. It is important to remember that the French language is spoken variantly in many places throughout the world, including Europe, Africa, the West Indies, and the former Indochina, as well as North America. Considering this variety in the Francophone World has begun to eliminate the value judgments that were characteristic of France's exclusively hexagonal perspective. Compare the relative differences within the English speaking world between an Oxford don and a Liverpool docker, between a taxicab driver from New Delhi and one from Sidney, between a member of the Canadian Parliament and an American Congressman. Yet all of these English speakers use what they all insist is the English language to express themselves, though one might "mind the lorry" while the other might "watch out for the truck," one might take the "lift" and another the "elevator," and one might write "colour" and the other "color." The francophone movement has empowered and emboldened speakers of French throughout the world, including here in Louisiana, to challenge the expression sometimes used to indicate non-standard speech, "Cela ne se dit pas" [That is not said], with "Mais oui, je viens de le dire" [Yes it is, I just said it]. I am grateful to Barry Jean Ancelet, French and Francophone Studies, University of Louisiana at Lafayette, LA for having provided me the above-noted, as well as authorization to re-produce his article here.